Norman Toll (1932-2014). Formerly Art teacher at Oriel High School and East Norfolk Sixth Form College. As well as teaching Toll continued to pursue his passion as an artist. 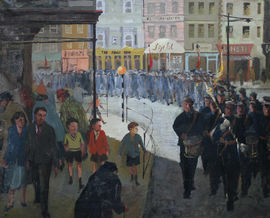 Toll produced oil paintings of the Great Yarmouth area, often crowded figurative scenes such as Britiannia Pier and the Marching Band. He died aged 82.